When it comes to 4K TVs, the tech is still ahead of the content. Jaw-dropping screens have never been cheaper, but finding stuff to watch on them still feels like homework. This guide will walk you through how and where you can find the best 4K content. If you want to make sure you have the right gear, we go over everything you need in detail in our 4K TV Setup Guide, and we recommend running through that checklist first. On-demand streaming services like Netflix and Amazon Prime Video provide some of the simplest ways to access 4K. With Netflix, you’ll have to upgrade to the $15.99/month Premium plan, but Amazon’s 4K content is included in all of its Prime plans. With nearly 600 titles, Netflix has the largest 4K streaming library by far, mostly due to its vast library of original content. And because of its compatibility with just about every device and smart TV, it’s also one of the easiest ways to access 4K movies and shows. Netflix was one of the earliest adopters of the technology, debuting its first piece of 4K content in 2014 with the second season of “House of Cards.” Since then, it has filmed all of its original titles in 4K, and many more in HDR (High Dynamic Range). However, outside of “Planet Earth” and other nature documentaries, it doesn’t have much in the way of licensed 4K content. Few types of TV would benefit from 4K as much as live sports. With quick movements and small details like baseballs and hockey pucks, the increased frame rates and resolutions on 4K TVs could transform the way we watch sports. Unfortunately, catching a game in 4K is still more of a novelty than the norm. For now, here’s everywhere you can watch sports in 4K. It currently has three networks that stream some content in 4K: Big Ten Network, FS1, and NBC Sports. You won’t be able to regularly catch your local team on one of those channels—and it could potentially get blacked out if it’s also airing on your regional sports network—but you can catch some legitimately big matchups, particularly in the Premier League and MLB. For a full schedule of 4K games, check fubo’s calendar. DIRECTV is the only company (streaming, cable, or satellite) with channels that stream entirely in 4K. Channels 104 and 105 exclusively play 4K video, while 106 has a mix of 4K and standard content DIRECTV shows regular season MLB and NBA games neary every day, along with marquee Premier League matches once or twice a week. It’s also the exclusive broadcaster of the Masters Tournament in 4K. You can find DIRECTV’s 4K sports schedule here. You’ll need DIRECTV’s Genie HD DVR (models 530 and up), but this is included in your monthly price when you sign up. If your model is older, DIRECTV is offering instant rebates to upgrade to the latest version. DISH Network’s 4K programming is mostly limited to on-demand content—including EPIX’s full 4K catalogue—which can be found by navigating to channel 540. Unfortunately, it’s still pretty far behind DIRECTV and fubo when it comes to watching live sports in 4K. DISH made a splash by showing the 2018 World Cup in 4K, and it also teamed up with Fox Sports to broadcast several college games during the 2018 football season, but there’s no word yet on its future 4K sports plans. Although DISH’s 4K content is included in all its packages, like DIRECTV, you’ll need to purchase DISH’s latest DVR equipment (the Hopper 3 or 4K Joey) to access it. Like Netflix and Hulu, movie rental services give you the ability to start streaming in 4K the day you bring your new TV home. They typically cost between $5 and $8 to rent, and you’ll have access to them for 24 hours. Each service also gives you the option to buy a movie for around $20. Vudu is the clear leader when it comes to 4K and HDR movie rentals, with more than 550 titles available to rent or buy. It’s compatible with most 4K streaming devices, including Samsung and Vizio smart TVs, Apple TV, Chromecast, Roku, Xbox One X, and PlayStation 4 Pro. The big name missing from that list is the Fire TV—Amazon prefers you rent your movies directly from them. 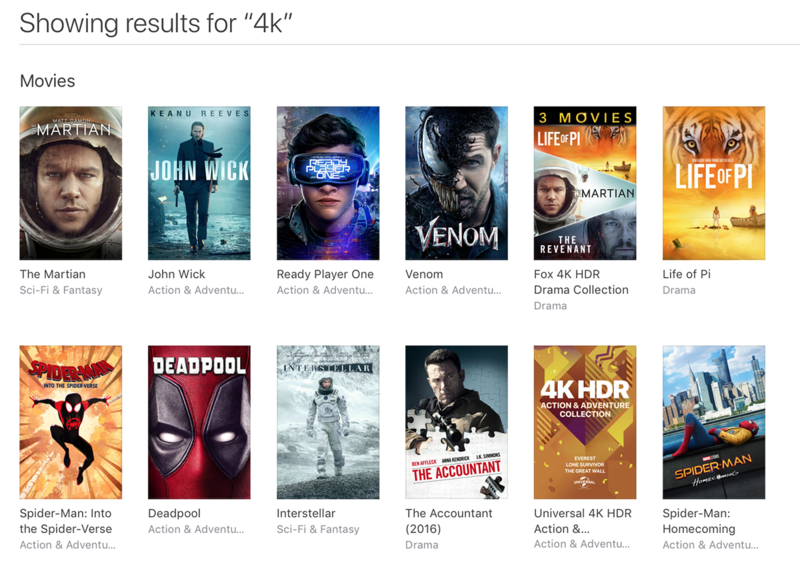 iTunes has a solid selection of 4K titles in its library, but you’ll only be able to access them on Apple hardware. As of right now, only Apple TV 4K, iPhone 8 and up, and iPad Pros are capable of playing 4K movies through iTunes. One nice feature is that iTunes automatically plays in the HDR type and resolution that’s compatible with your device. It also doesn’t charge extra for 4K, so titles are often several dollars cheaper on iTunes than other rental apps. FandangoNow has an impressive collection of 4K and HDR movies, and unlike a lot of services, it makes them exceedingly easy to find. There’s a list of all 4K and HDR titles on its website, separated into 4K-only and 4K with HDR, and the app also has a category devoted entirely to 4K. FandangoNow works with Samsung, LG, Vizio, HiSense, Sony, and Android TVs, but it’s more limited when it comes to streaming devices: Roku is the only one with an on-device app, but you can also stream it to your TV through your phone with Apple TV or Chromecast. 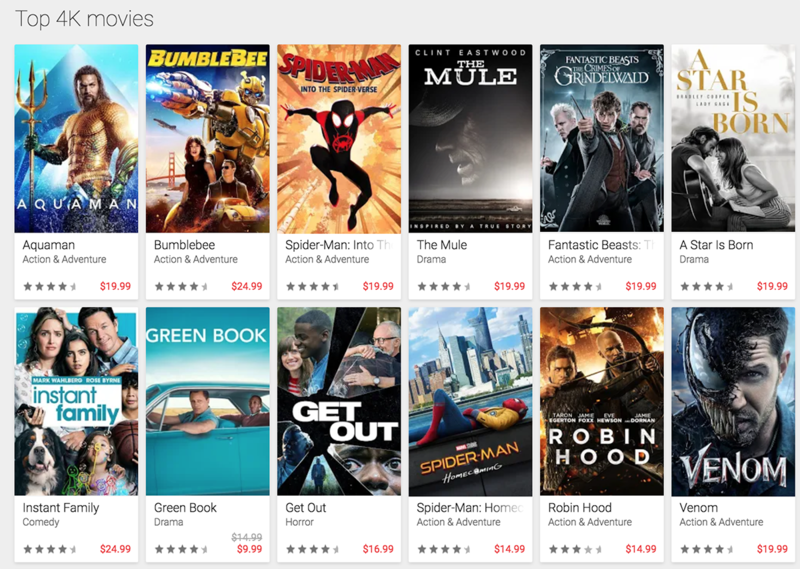 Like iTunes, Google Play doesn’t charge extra for 4K, and many of its titles are a few dollars cheaper than we saw on other services. In 2018, it even took the generous step of upgrading all eligible purchases to 4K for free. Google Play is available on LG, Samsung, Vizio, and Android smart TVs, as well as every major streaming device save one: Amazon’s Fire TV. If you want the best quality from your new 4K TV, you have to go a little old school. The bit rate for Blu-rays can be as much as ten times higher than streaming video, so they’re better at processing the large amounts of data required for 4K and HDR streaming. That means noticeably smoother and sharper videos without any buffering. Unfortunately, older Blu-ray players can’t play 4K Blu-rays, so you might need to invest in new equipment. You can find a quality 4K Blu-ray player for under $200, and it will still be able to play older Blu-rays, DVDs, and CDs. In addition, Xbox One S and One X can also handle 4K Blu-rays. While YouTube has some 4K movies available for rental, where it really shines is with its free, user-uploaded content. Accounts like the HDR Channel and Jacob + Katie Schwarz specialize in jaw-dropping nature scenes that seem to exist just so you can show off your new TV’s prowess.